A few weeks ago, I needed to offer the children a chance to do some critical thinking, so I decided to show them how to solve sudoku puzzles. 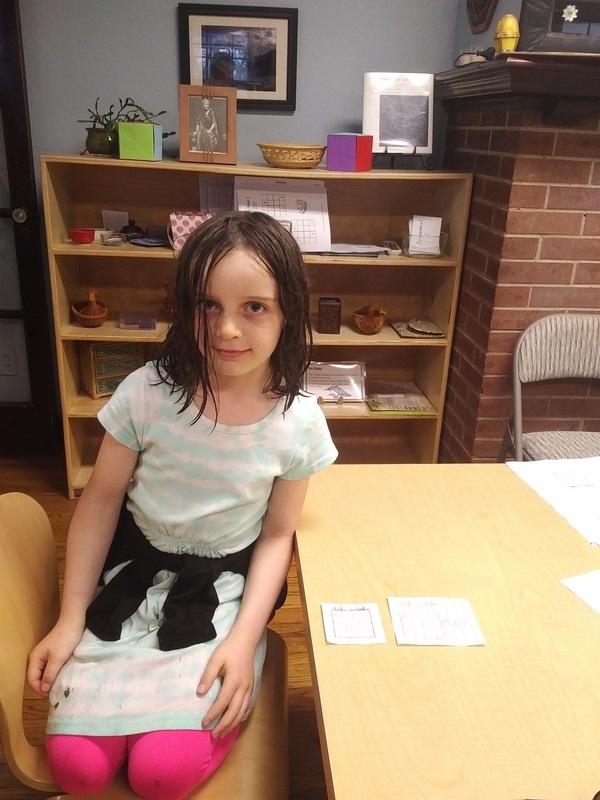 Sudoku is a logic-based, combinatorial number-placement puzzle, which I greatly enjoy and knew many of the children would likely enjoy as well. “I think it’s logic,” she said. I promise I did not give her that vocabulary- she already had it. There’s not actually a logic shelf in my classroom, so I put the work on the math shelf as math and logic are so closely interrelated. Then again, in the Montessori classroom, *everything* is interrelated. About twenty minutes later, she came back. Elspeth and I sat down together, and I gave her the first step of making a filled-in sudoku, which followed the rules for the puzzle with her choice of items. Elspeth chose shapes. She completed that. Then I told her she had to make an empty sudoku with just a few clues taken from the first filled-in one she had just made. She did that and returned to me. 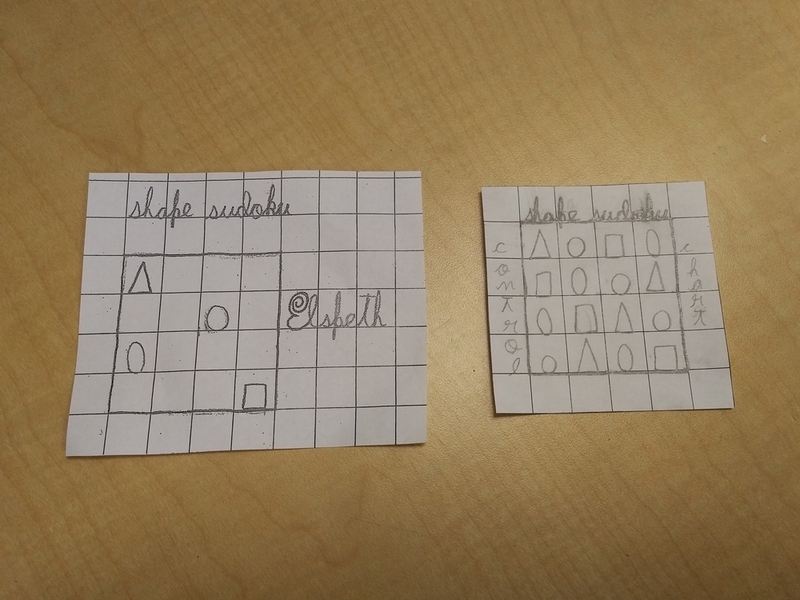 Then, I told her to copy that one and solve it without using the original to see if it would be solvable for others. She did that third step as well. After that, it was a question of copying it, cutting it to size and putting it on the shelf. I replied, “Oh, if you are interested in that, ask Elspeth.” After two or three of these iterations, I wrote the above message on the board to simplify things. 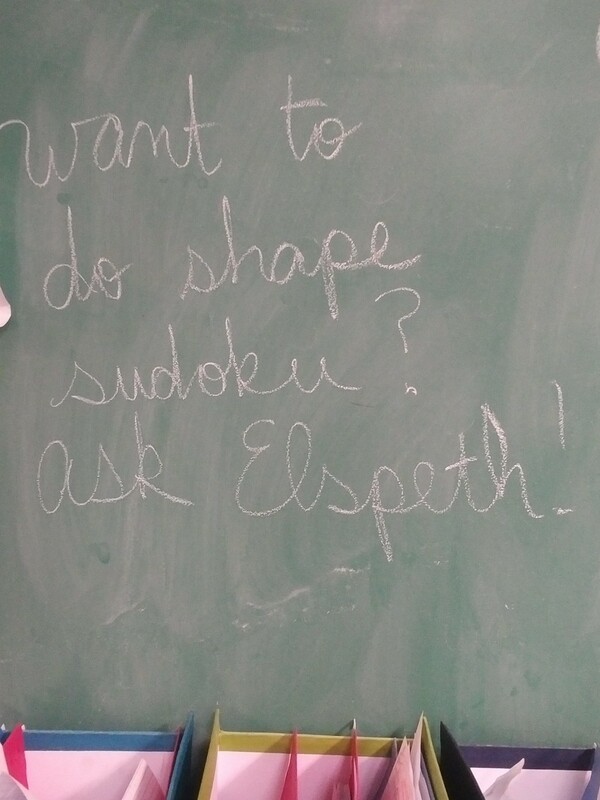 Since then, Elspeth has made a letter sudoku with one friend and joined with two other friends to make a color sudoku. They are very popular with the children, and many are now asking if they can make their own sudoku puzzles. I send them to Elspeth to learn how. To my mind, this is an example of where work can go if the children are given the ability to think about and create their own work. It’s also where work can go if it doesn’t have to fit in a “subject” box. Is it math? Sure! Is it logic? Of course! Is it art if I must draw the shapes that fit the puzzle when I make it? Probably. Is it a lesson on how to use the copier? Absolutely. Next Next post: 2 minutes 41 seconds?